This Sunday’s cooked breakfast included eggs and bacon, coffee and tea, and crumpets with lemon curd. Crumpets are similarly shaped as English muffins, and are eaten similarly for breakfast with toppings of butter, jams, etc but they are NOT the same. One difference is that crumpets are cooked on one side, with bubbles and crannies appearing on the top side only. 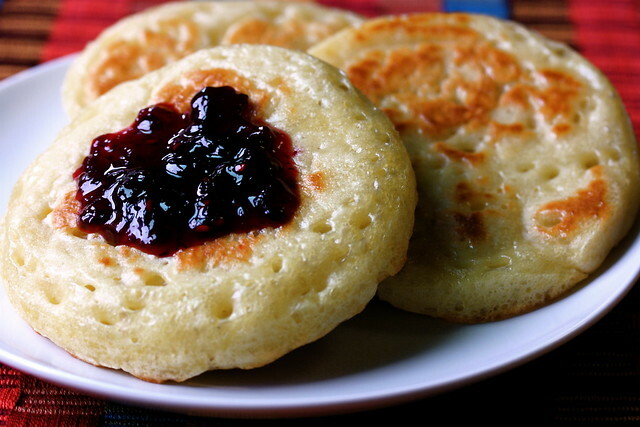 They are not split in half as are English muffins, and they have a more tender texture. I inserted them into the toaster unsplit, and afterwards spread lemon curd (a topping tasting and looking quite like lemon pie filling). They were tender and tasty and definitely, in my opinion, better than English muffins and will be replacing them in my household from now on.